There’s nothing wrong with enjoying the fall color from below – looking up from the seat of your bike or your car as you pass a blazing hillside of red, gold and orange maples. Hard-core foliage fans, however, won’t be content until they’ve climbed the summits of a few hills to enjoy the autumn display from above. Not all hills, however, are created equal. Sometimes, you huff and puff your way to the top of a big summit, only to discover that there’s no view, except maybe a new perspective on strip mall parking lots. Sometimes it’s just, well… not perfect. We’re talking extreme leaf-peeping, after all, and that’s not just about finding a bunch of trees in full color. It’s a matter of finding that perfect spot with just the right balance of tone and hue, with a proper framing and at least one interesting feature – a barn, perhaps, or a body of water – to add a little artistic flair to the scene. So here are a few of our favorite hills. What are some of yours? Traverse City’s own tiny ski area sits at the top of Randolph Street on the city’s West Side. 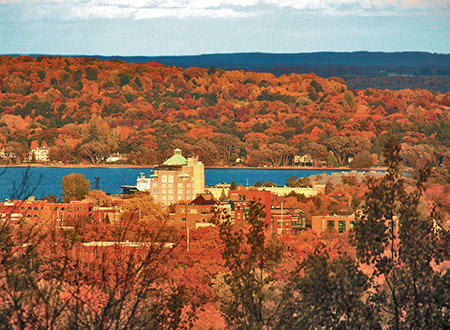 In the winter, of course, it’s busy with skiers and snowboarders, but if you’re up for a fall climb, this is the hill that will give you the quintessential view of Traverse City from on high. 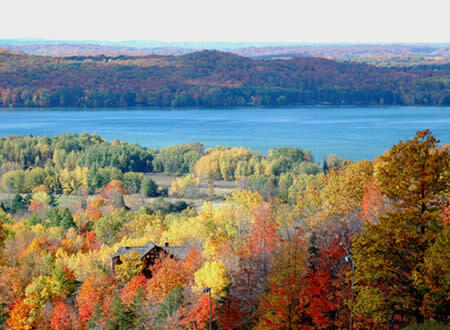 It’s particularly impressive in the fall – especially in late afternoon when the sun casts a reddish glow over the city and the tree-covered hills of the Old Mission Peninsula on the other side of the bay. The best viewpoint is on the north side of the ravine that runs down the middle of Hickory Hills, at the starting point for the Swede ski run. And since the rope tows aren&apos;t running this time of year (and they wouldn’t help even if they were), you’ll have to make the climb on foot. Hey, it’ll be good for you! A slightly different view of the city (with lots more trees, too!) 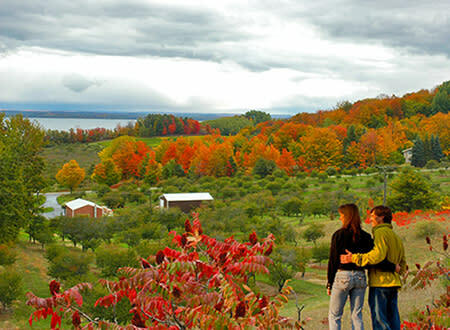 can be had at the top of this hiking trail on the grounds of the Grand Traverse Commons, whose 500-acre campus is criss-crossed with paths and trails. There are several ways to the top, which once (of course) boasted an extensive fruit orchard; before you go, check out this map. This hill must be climbed, but the view is quite lovely – and since you’re not standing in front of somebody’s house you can linger as long as you like. There’s even a nice bench to sit on. The roller-coaster hills of M-37 on the Old Mission Peninsula are already well-known for their awesome fall color landscapes. Most famous of all are the fine scenic pull-out above the Chateau Grand Traverse winery and the hilltop site of Chateau Chantal – both with breathtaking views of West Bay and Power Island. For perfect framing, it’s hard to beat the narrow little Hog’s Back, about a mile south of Chateau Chantal, just past the place where Smokey Hollow Road splits off to the east. Here the land falls away steeply on both sides of the road – but it’s the view of East Bay that’s particularly dazzling. Something about this little-sheltered valley seems to make the vegetation glow with an extra intensity. There’s not much room to stop and take a picture, but people do it anyway. 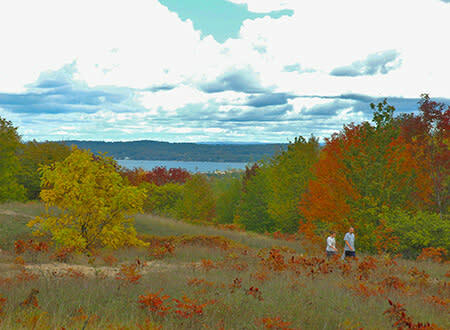 You can’t talk about fall scenery and not mention the Sleeping Bear Dunes National Lakeshore, but looking for autumn color at Sleeping Bear isn’t always easy. The trick is to find a spot where you can enjoy the gorgeous views of sand and water without missing the intense reds and golds of the hardwood forests that begin on top of the dunes and roll gently eastward. But it’s an ill wind that doesn&apos;t blow somebody a little good sometime, and that’s certainly true of the disastrous 2015 windstorm that snapped and uprooted thousands of trees in the Glen Arbor area. The storm devastated Alligator Hill, whose reptilian snout divides Big Glen and Little Glen Lakes from each other – but it also opened up dozens of new viewpoints along the Alligator Hill Trail. 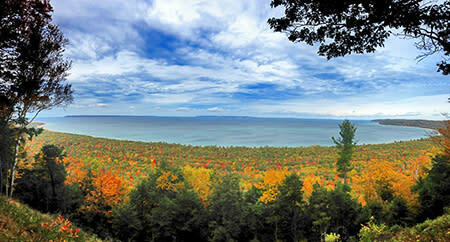 It’s a good healthy hike to the top, passing the ghostly traces of a Roaring Twenties golf resort that was never finished, but the autumn view over Sleeping Bear Bay is unsurpassed!